If you book your tickets before midnight the day before your visit we’ll give you extra free rides on top of your ride tokens. As a guide, you’ll need between 4-6 tokens for each ride that you go on. If you want to go on the ride with your children you’ll need tokens for each adult too. Don’t forget that you can also use the tokens at our classic side stall games: things like Hook-a-Duck and the Coconut Sheet are very popular with children of all ages. Our most popular deal is £30 and it gives you around 12 rides or games, with 5 extra free rides on top of that! Admission free. Opening times: 11am - 7pm daily. With Fairground Art & Heritage Tour on Sunday 4th August at 10am. Dogs welcome but please keep them on the lead. Postcode: BA1 2NQ. Getting there: By bus: Stop at Cranhill Road E-bound (20C), Marlborough Buildings W-bound (20A), or Park Lane E-bound (1, 14, 21, 37, 38, 39, 319, 716, A4, X39). By train: The park is a 20 minute walk from Bath Spa railway station. By car: The Park is a 5 minute walk from Charlotte Street car park, or a 10-15 minute walk from Broad Street car park. There is plenty of parking available in the city. Buy tokens online up to midnight the night before your visit to claim your extra free rides. If you redeem your online booking on the wrong day you will get half your free rides. How much do rides cost? We take tokens for rides and games, and cash for food. 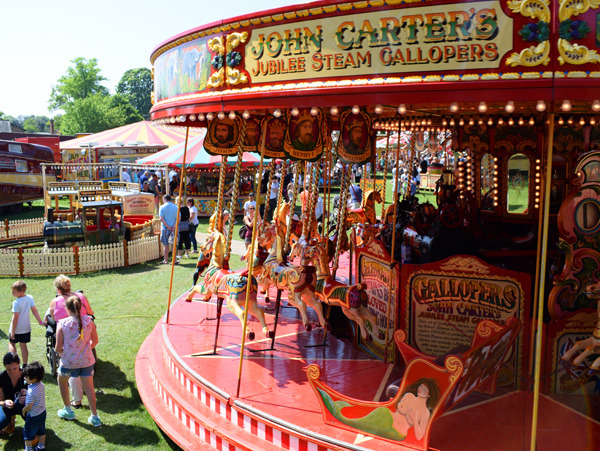 You can buy tokens online in advance here to get great free ride offers, or alternatively come to the fair where you will be able to buy tokens using cash or card and get other offers. There are rides for all ages, most of the rides for younger children like the Austin Cars and the Train Ride are 4 tokens; rides like the Galloper and the Ark are 5 tokens; and thrill rides such as the Skid and Octopus are 6 tokens per person. You can find out more about our rides on our rides and attractions page. You can collect your pre-paid tokens at the Token Booth when you get to the fair. You can buy additional tokens on the day with card or cash, but you get the best value for money by booking in advance up until midnight the night before your visit. We have various food and refreshment stalls on the fair which take cash: fairground staples such as Candy Floss, the Fish Bar, Ice Cream Van and the Doughnut Stand. Carters Steam fair operates come rain or shine, and many of our rides are under cover. There's lots more information to help you plan your visit to the fair on our prepare for your visit page.